Can it take down the defending champ, the Alfa Romeo Giulia QV? Jaguar wasn’t messing around when it decided to stuff its most powerful engine into its most agile sedan, so it makes complete sense the resulting XE SV Project 8 will soon attempt to set a new Nurburgring four-door lap record. As per Autocar, the 590 hp super sedan developed by Jaguar Special Vehicle Operations will soon take on the Green Hell in an effort to dethrone the current sedan record holder, the Alfa Romeo Giulia QV. In order to achieve its goal, the XE SV Project 8 will need to beat the Alfa’s 7:32 time. We think it’ll happen. Why? Because Jaguar developed this thing specifically for extreme track performance. Powered by the 5.0-liter supercharged V8, the XE SV will also have all-wheel drive and a specially tuned version of the familiar eight-speed ZF automatic gearbox. 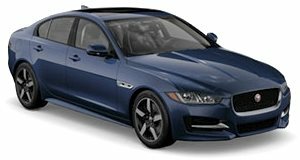 Given the added grip of AWD and the uniquely calibrated transmission combined with a 0-60 mph time of just 3.3 seconds, the XE SV is in a prime position to take down the Giulia QV. Furthermore, the XE SV performance specs are awfully similar to the Porsche 911 GT3. As we were told at Frankfurt last month, SVO went above and beyond its original V8 adding instructions; the car’s body has been seriously reworked. Although it looks similar to the regular XE, the XE SV’s bodywork is 75 percent new, with only the roof and front doors remaining the same. Even the front headlights were moved forward in order to make space for that big V8. With its lightweight carbon fiber hood and whisker-like front air vents, it’s clear SVO intended this cat to be fast. No specific date has been set for its probable Nurburgring run, but customer deliveries will begin next spring, so figure Jaguar will make an announcement sometime before that.